Can't figure out what dessert to serve after an asian dinner? Try Wasabi Ice Cream! But beware! Use too much and it will pack a punch! Let me start by saying I am very sad that the ice cream is a little melted in this post. I don't care how fast you are, there is no way to photograph ice cream in August in DC and not have it end in a melted disaster. Ugh. Moving on! My roommate's fiancée decided to throw a dinner party centered around the things he loves: food and Asians, most specifically his Asian fiancée. Happily he got a large turnout, tons of food and tons of Asians. He specifically mentioned in the email needing desserts....but really, nobody expects me to ever bring anything but a dessert anymore, right? I am fairly certain I called dibs from here to eternity on that one for any and all parties I ever attend. But what to make? Fortune cookies? HA! I know I'm a silly American but I do happen to know a few things and fortune cookies are based off a Japanese recipe, made popular by the Chinese and practically only eaten in America. No dice, fortune cookie. You don't make the grade. My next idea.............well that took a lot longer to come up with than I would have thought. Mango pudding? Litchi.......um, never cooked with that before. I found it somewhat amusing that I can make sushi pretty well but not an Asian dessert. Finally I resorted to googling, and since I am studying ice cream this year, decided to make an Asian inspired ice cream flavor. Wasabi was just too irresistible to pass up. It was so tasty! 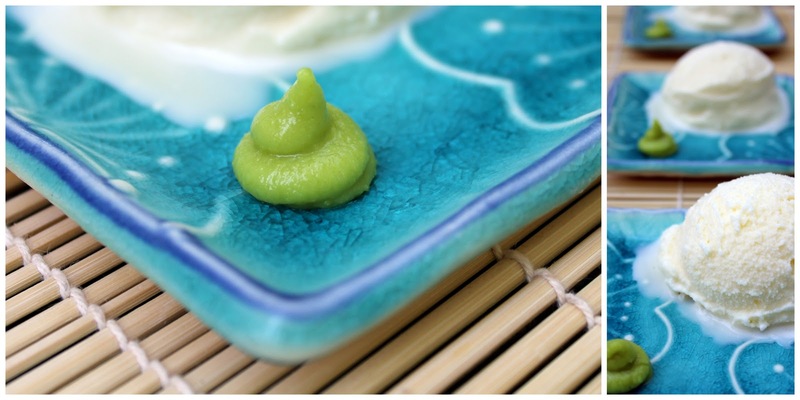 If you use the right amount you get the taste of wasabi without the burn in your nose. But, I'm sure for some people that would just mean I'm weak sauce. Call me old fashioned but ice cream was not meant to burn. Gently mix in the cream, milk and wasabi.